Citi won’t be allowed to fall, we got accustomed to violent swings pretty fast and I admit it: I’m addicted to stock charts. During this crisis a lot of “unthinkables” occurred, changing our perspective on the financial markets and their institutions. I don’t believe anyone dared dream both Bear Sterns and Lehman Brothers might go bankrupt nor Merrill Lynch sold. Still, investment banks are one thing. Huge retail Banks are a whole other matter. Investment banks had the reputation of financial troublemakers, even though they were thought to be stable and profitable (which they were for quite a long time). Retail banking is one of the cornerstones of our economy. Should Citi fall the ripples will surely tear through the global financial world faster than any shockwave. Banks worldwide have billions of dollars in exposures to Citi and its many activities, a staggering blow indeed. That’s why I’ll risk saying Citi won’t be allowed to fall (much like the automakers). I may be forced to eat my hat in the weeks to come but I’ll take the chance. This obviously shouldn’t motivate anyone to invest in Citi right now as we’ve seen how low bailed out stocks can go. Oddly enough we’ve got accustomed to violent market swings quite fast. Only half a year ago shifts of 4% in any market index were reason for extreme fears, panic or hope (remember that 10% daily surge?). Today, 4% shifts are hardly breaking news anymore and almost nothing will surprise investors. Volatility is immediately translated into risk and risk into premium which surely enough puts enormous pressure downwards on stock prices. The first sign for household investors to slowly yet steadily make their way back into the market (in the fortunate case you’ve liquidated yourself) will be reduced volatility. Sure we might miss on the significant surge up (which will eventually present itself) but we will also avoid another bull trap like the ones only recently avoided. 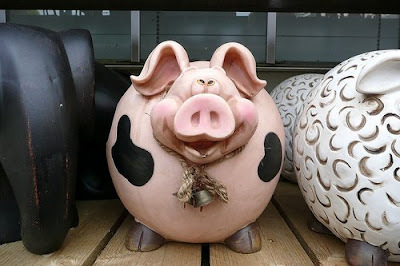 Keep in mind an old market saying: Pigs get fat and hogs get slaughtered. Are we, with all the required reserve, hogs or pigs? Are we waiting on lower and lower levels before jumping back in? I’m starting to move restlessly in my seat. I don’t know about you but I’ve found myself staring a lot more in stock charts lately. There’s something fascinating about the way they plummet downwards. I think it’s the assumption some stocks will skyrocket back to previous levels and new highs. Unimaginable daily drops catch my eye and I keep wandering back to the screens whenever I have 5 minutes to spare. I do believe I’m becoming an addict. « What Should I Do With My Money?